It was 12:30 Midnight and i was still awake coz Muslims are conducting religious meeting using horn mic's at this hour in my neighbourhood. FYI I live in new city of Hyderabad . I called Police control room around 10:45 PM and raised the complaint . Police Officer after understanding its complaint against Muslims tells me that its falls under "Sound Pollution" and I shud call them ONLY after 11:00 PM. I called after 11:00 PM and raised the complaint of high sound pollution again, he has no other option to avoid me , told me they will look into my complaint. Later Police officer called me around 11:40 and tries to convince me that they (Police) can not stop Muslin meetings coz as it will take communal angle. He was trying to convince me that Muslims will not listen and easily gets provoked and I shudnt force them to stop this midnight Muslim religious meeting. I asked the Police Officer then why do you close down Ganesh Mandaps around 10:00 PM and allow Muslims to use horn mics even after midnight and disturb Hindu neighbourhood. These Midnight meetings earlier were common ONLY in HYD old city where Muslims were in big number. 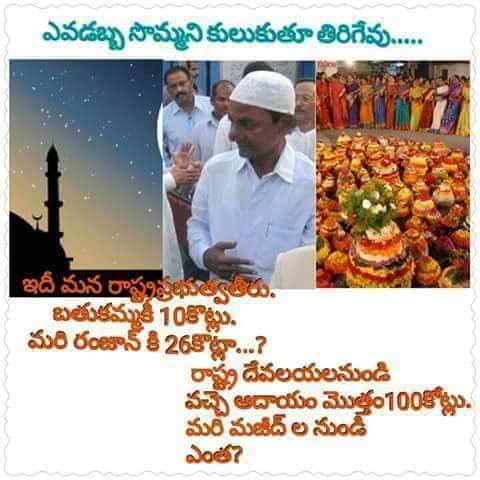 But after KCR has become Chief Minister , the Islamic fanaticism has spread to HYD new city . The fear of Muslims in Telangana is such that even Police are scared to handle them. This is the price we Hindus have to pay for voting KCR. 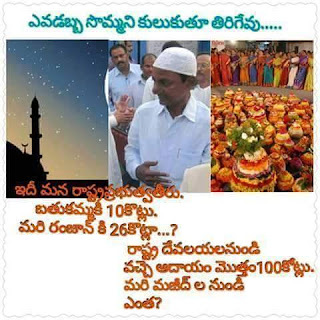 Telangana fastly becoming highly Islamised state in India , coz of unprecedented support they get from KCR.